Lovin’ the Ecoupons at Safeway! I went to Safeway last night (and also technically this morning as I was in line at midnight) with out any solid plan other than a few things I knew I wanted and with a ton of e-coupons to use, so when I checked out and saw how much food I bought for so little I was more than pleased. I bought all this for just $40.07! Plus, I will be sending in for a $10 rebate for buying 10 boxes of Nabisco crackers, and I didn’t even spend $10 on them all! = $7 and I will get a $10 rebate for buying 10. A $3 overage! 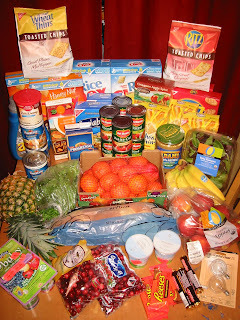 I had even more coupons I used and I also used a $10/$50 purchase catalina I had received from my last trip bringing my total to $40.07 which I put on my Safeway gift card making this a very inexpensive grocery trip. For some of the coupon sources go to the Safeway posts here and here. Can you explain the cracker deal? How do you know you will get $10 off? I don't see it in the ad. Thanks for the tip! I tried it on the BC frosting and I got it for $ .19 today!!! How great is that? Sorry to be so slow in replying to the questions on cellfire coupons. I'm getting ready for a party tonight, so this will be brief, but I'll explain more later. I recently heard from one of our readers that the cellfire coupons build up if you don't use them and that they all come off the one product at check out. You don't have to do anything special, just buy the number of items specified by the one cellfire coupon and then any coupons available on your cellfire account will come off automatically. HTH's for now! Yes… it would be great if you would review the cellfire thing again. Why are you showing two cellfire coupons for those items? YOu can use two cell-coupons on one item? Also, say if i were to buy two items that had cellfire coupons, it would apply to both items wouldn't it? Could you explain how the cellfire coupons work? I didn't know that I could use multiple cellfire coupons on one item. I can't even get my card to load more than one. Any tips? How do you do the cracker deal? Is that in the ad somewhere? i have a similar story, but with a bit less food from my trip to Safeway today – $15 for 2 bags worth of food thanks to some paper coupons and a whole bunch of ecoupons. I figured out that ecoupons gave me at least $4-5 in overage, which was especially awesome!